Canine-scent work is becoming more popular by the day. These are just a few questions that are asked time and time again, encouraging Rob to share his knowledge and bring in coaching techniques that can help you and your clients. Rob Hewings is a highly experienced Canine Trainer, who retired from the Metropolitan Police after his 30 years’ service, 25 of which was as a Police Dog Handler. The final ten years as a full-time trainer with the Metropolitan Police Dog Training Establishment. He has enhanced this experience with a BSc (Canine Training and Behaviour) MA (Professional Practice Police Dog Training) and is presently engaged Doctorate of Professional Practice (PhD) Canine Scent Detection. Rob has instructed all police canine disciplines from puppy training through to specialist search (explosives and narcotics), from training the General-Purpose Police Dog onto firearms support (SWAT support dogs). Rob is the head trainer at the newly established UK College of Scent Detection, and has lectured at Bishop Burton College, (Canine Training and Behaviour). Rob is also involved in research programmes for ‘ambient scent’, enhancing canine learning, and continuing research into scent alert for nightmares and night terrors, particularly within PTSD. He is a board member for Southern Diabetic Retrievers Louisiana USA, where his training programmes and course design are being used for Diabetic Alert Assistance Dogs. As a qualified Canine Behaviourist Rob knows the importance of a positive training schedule with the dogs he trains and the people he coaches. 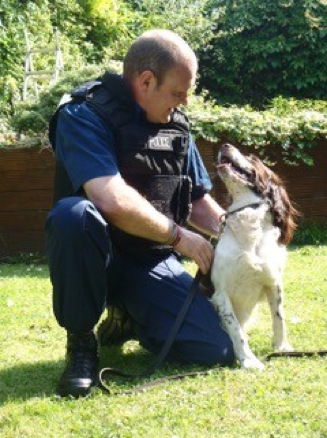 He wishes to share his love and experience of search training with people and their dogs. Witnessing the enjoyment, enthusiasm and excitement the dogs get from being engaged in the natural process of ‘nose-work’ has been his guilty pleasure for the last 25 years, long may this continue! !